Can you guess the cost of this Mobile phone? I was browsing through GadgetsGuru (GG) and tiny little ad struck me. I couldn’t believe what I saw. I checked, double checked and re-checked. What I saw was real. Not quite sure why. 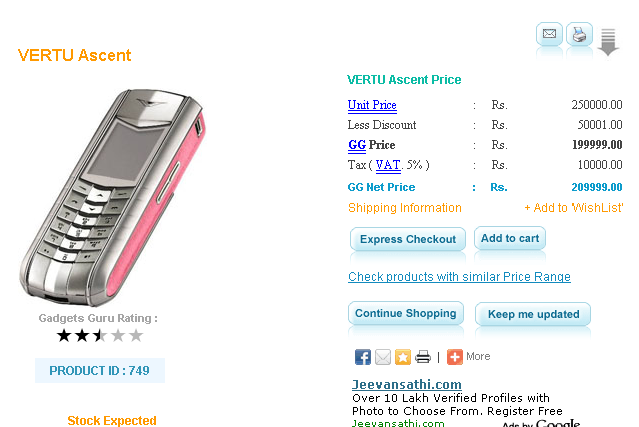 A phone called Vertu Ascent which looks like a feature phone costs Rs. 2,09,999. That is after a Rs. 50001 discount from GG. One can get a brand new Android phone with the VAT that is laid on this VERTU. There is a trend off late to price feature phones just for the sake of it. Call it vanity or uber rich but I just don’t get it. Neither do I get the feature phones which are built under the garb of simplicity. There is a £37000 phone which does nothing. Then there’s a world’s simplest phone which costs quite a bit. Take a look at our list of cheapest Android phones and you will be amazed at what you can get for ten thousand Indian rupees. I mean seriously folks, what does this phone have that it has to cost 2 lakh rupees. Yeah I looked at the specs and they look like normal specs to me which are found in a Rs. 3K phone. Can someone explain what’s going on? Or is it the beer goggles cheating me again? But then I don’t really drink beer. Vertu Ascent, doesn’t it sound like a car name? May be that’s where the price is coming from. Still confused. Don’t like. Help. Guess what the browser header had as a title. Almost feels like a Friday. Wow…Predict traffic jams before they happen! You pay for the Vertu brand. Did you know they come with a concierge service at the press of one button? It’s like complaining about the cost of a designer pen or shoes or wallet when you can get the functional equivalent for 1/10th the price. People who get Vertu don’t bother about the price – if you have to ask, it’s not for you. That said, I would be drunk or insane or insanely drunk to even consider one of these phones. This company releases phones having GOLD plated, Silver Ceramic, Stainless Steel, Diamond studded, in fact few phones with titanium gears inside the phones. Before the iPhones, BB, Samsung etc, they were a craze among the hi flyers of hollywood and business. Not sure how well they are doing now. Luxury cars I understand. Luxury phones is something which I am trying to understand. That’s how this post came up. See the discount these guys are offering is 50K and the VAT is 10K. Sure people will love to buy these phones. But they might be having a hard time explaining it to other folks. I heard this is gold plated stuff. May be that will prompt others ask what this phone is about. Once you are done explaining, then you might say, that’s it? May be we are just too much into phones doing more. Virtu is there for a long time in expensive luxury phone segments. It was bought out by Nokia, I dont know what it is now.